How to replace Jeep Cherokee KL cabin air filter. Cabin air filter on Jeep Cherokee KL must be replaced every 2 years or 20.000 miles. When you need to replace cabin air filter you need to follow some simple steps. Locate Jeep Cherokee cabin air filter. The Jeep Cherokee KL cabin air filter is located inside of the car on the passenger side in front of the evaporator on the lower right of center console. Remove the passenger side console closeout cover. Pull the console closeout cover rearward to disengage the front retaining tab and remove the cover. Remove the filter door by pushing down the tab on the top of the door to release the cover then rotate the door out and lift up. 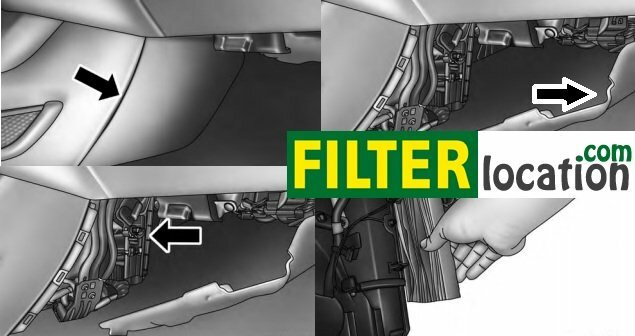 Install the A/C air filter with the air filter position indicators pointing in the same direction as removal. The A/C air filter is identified with an arrow to indicate airflow direction through the filter. Failure to properly install the filter will result in the need to replace it more often. Install the passenger side hush panel under the dash panel and console closeout. The A/C air filter is identified with an arrow to indicate airflow direction through the filter. Failure to properly install the filter will result in the need to replace it more often.